Completion of this course carrries 15 SACE CPD points. With this interactive online course you will quickly build on your basic knowledge of and begin to speak in complete sentences. Through a combination of memory games and video, it will increase your confidence in using the language in a variety of situations. You will build your confidence with conversational skills, phrases and sentence structures. Because learning is easiest to absorb when it is entertaining, the course uses games to engage both the logical and creative sides of your brain. Combining words in visual and audio form to make context, it improves your memory and will help you to remember key words and phrases. The goals are achievable, broken down into a series of rewarding challenges. As you play interactive games, you're fed new words and pictures to reinforce your memory, and then test your knowledge with quizzes. You'll hear your new language constantly and, using the recording games, you can start speaking right away and also compare your voice to a native speaker. Learn useful conversational phrases that you might need abroad, such as "I'd like to pay by credit card" and "My camera has been stolen". Use structures that can be adapted to fit different situations and put together complete sentences. Build your confidence in speaking. Cover nine different everyday situations: meeting and greeting, shops and restaurants, getting around, hotels, phone calls, emergencies, leisure and business. 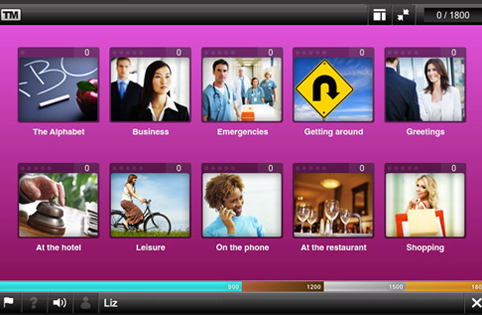 Use quizzes within each section test you on the vocabulary you have just learnt. Use printable vocabulary sheets with each topic for you to take away with you and keep learning on the move. Benefit from video footage that allows you to see body language and lip movements of native speakers. Use the alphabet section to learn the individual sounds. Learn from any of over 70 native languages. If English is not your first language, you can change the course instructions to your preferred language. * For people who are new to this language, we recommend that you also use our Talk Now course (beginner-level) which will give you an introduction to basic vocabulary and phrases. When you are ready to progress, higher levels are also available separately for most languages to help to you develop your skills further.